As already explained in previous post, design criteria is guideline values for designing new wastewater treatment facilities which is determined through research and laboratory scale model studies as well as operational experience. 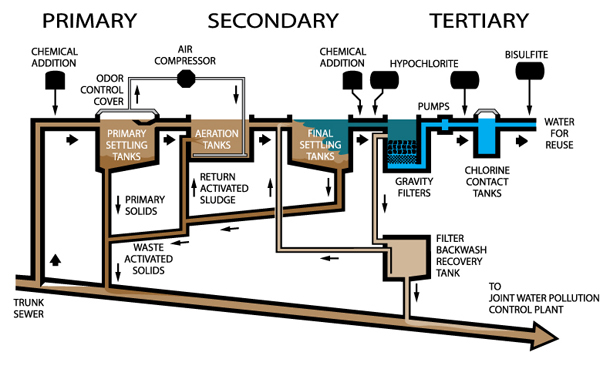 In this post I want to discuss more about the design criteria of wastewater treatment plant. It is important to note that the design calculations are usually based on certain assumptions. Hence, it is important to have a clear understanding about the concept of design criteria and the significance in determining capacities and dimensions and wastewater treatment units. Detention time or hydraulic retention time is the average time spent by the influent sewage in the aeration tank. It is calculated as tank volume (m3) divided by flow rate. Clearly the higher inflow rate Q, the sooner the sewage influent will reach the outlet and therefore the lower the residence time or hydraulic retention time will be. In designing wastewater treatment plant, hydraulic retention time must be sufficiently long to remove the requisite proportion of BOD from the untreated wastewater. In a conventional activated sludge system, the HRT will be between 5 and 14 hours (source). Hydraulic residence times for primary settling tanks (tanks used in the treatment using flocculent settling) are from 1.5 to 2.5 hours. Design considerations should include effects of low-flow periods to ensure that longer residence times will not cause septic conditions. Septic conditions increase potential odors, solubilization, and loading to downstream processes (source). The solid particles in wastewater experience two types of velocities in any tank where the flow is continuous, one along horizontal direction due to drag force and another along the vertical direction due to gravitational force. The horizontal velocity is called flow through velocity, while the vertical is called settling velocity. Flow through velocity is the velocity with which the wastewater flows through a treatment unit. It is equal to flowrate divided by cross sectional area. In practice, the linear flow through velocity has been limited to 1.2 to 1.5 m/min for settling tank to avoid resuspension of settled solids (source). Understanding of particle settling velocity is used to determine the depth of treatment unit to separate suspended solid by gravity settling and to check the adequacy of length or diameter of a tank to remove particles before the effluent flows out of basin. A sand particle of 0.2-mm size with specific gravity of 2.65 is observed to settle at a rate of 2.3 cm/s (source). Surface loading rate or overflow rate is the volume of wastewater (flow rate) applied per unit surface area of the treatment basin and is normally expressed in m3/d/m2. This is a significant design criterion used to determine the surface area of tank. As surface loading rate is the hydraulic flow applied per unit surface area of the tank, it is also known as hydraulic loading. Typical values of surface loading rates for primary clarifiers are 600 to 1000 gpd/ft2 (source). Weir loading rate or weir overflow rate is defined as the quantity of wastewater flowing over a unit of weir length of the tank in a day. The maximum weir loading rate, to limit the influence of draw-down currents, is preferably about 300 m3/d-m (source). I will like to get your address and the cost of your products also the type of products you have.You can reach me on my Email. so we can descuss more. I am a fresh chemical engineer & your work is helpful buddy..